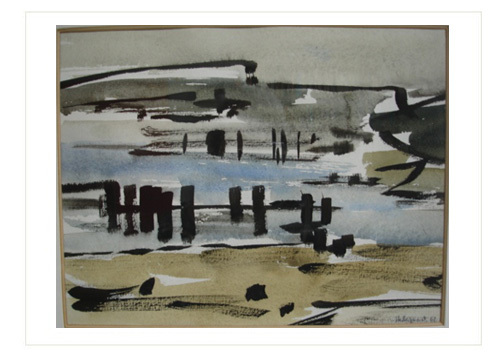 On view at the Rocket Gallery, London until 15 June 2013, an exhibition of work by Peter Hedegaard (1929-2008) features gouaches that he made from 1970-1977. An earlier exhibition of his work was held at the gallery in 2010, the first show since his death. Isolde Hedegaard, Peter’s wife and holder of his estate, has been involved with both exhibitions. 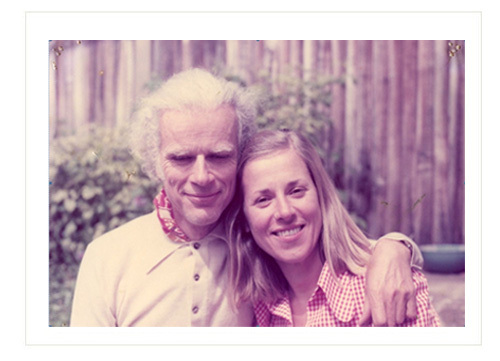 Here, in conversation with Chantal Condron, she recounts the period during which Peter worked and the influences on his art. Interview conducted in May 2013 by Chantal Condron, Curator, Modern & Contemporary Art, Government Art Collection. CC: Peter lived and worked during the 1970s at Belsize Studios, north London, the house where you still live. Can you describe a typical day in the studio? IH: He would get up, have coffee, read the papers, go into the studio and start work. He might stretch a canvas, mix acrylic for painting on canvas or he might decide to work on paper. These were generally gouaches. He would attach a sheet of Arches paper (traditional French paper used by printmakers and watercolour artists) on the drawing board and draw a design. When mixing the gouache, the colour was of the utmost importance and he had infinite patience getting it right. He put new work up in the living room and asked me to look at it, particularly if he was working on a new image or a significant variation. CC: Painting in gouache demands a different working discipline to using watercolour or oil – resulting in thick, opaque areas of colour. It dries rapidly and the depth of colour differs from wet to dry. Can you say why Peter chose to paint in gouache at this time? Had he worked with the medium before? Gradually as his work became hard-edged, his colours became brighter. He was skillful at working with gouache; getting it right was essential. Leading up to, and during the period Peter made the gouaches, he also produced large-scale paintings in acrylic. CC: How did Peter view the relationship between gouache and acrylic in his working practice – did he favour one over another? have no equivalent in gouache. I have only ever seen one in grey. He didn’t sign it. CC: So Peter used gouache in an exploratory fashion, as a way of working out forms and colour combinations that eventually appeared in his paintings? IH: He probably did. But for finished works I think he used every medium – gouache, acrylic, printing ink – for their individual qualities. 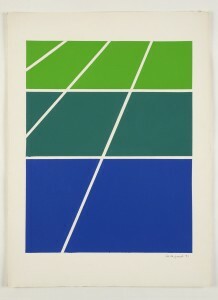 None of his prints are identical to any of his gouaches. It was important that they were not copies but art works in their own right. CC: Peter’s hand is clearly evident in the gouaches in the exhibition – you can see the faint traces of his pencil marks. Can you describe how he set about painting them? IH: By the 1970s, he used Arches paper that he brought back from France. This paper is so stiff and heavy, with a textured surface, that it didn’t need stretching. He drew the image in faint pencil lines. Colour mixing was the important and I imagine, difficult bit. I think he enjoyed making gouaches, getting the colour just right. The colour gradation corresponds exactly to the size of the shapes, so for instance, the smaller the shape, the darker and more intense the colour. The gradation of colour and the proportions of forms directly relate to each other. 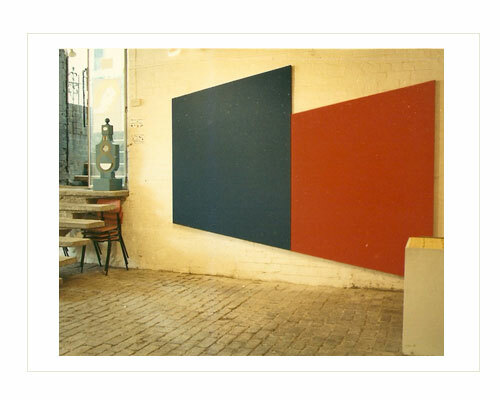 CC: The exhibition reveals different formal compositions that Peter experimented with – graded steps, trapezia, perspectives and sequential arrangements of squares and colours. One of the first things Peter did after I met him was take me there to show me Piero’s Nativity. We looked at nothing else; that was what we had come for. Later we also went to Arezzo together to see Piero’s frescoes [The Legend of the True Cross, c.1452-56, Basilica of San Francesco]. 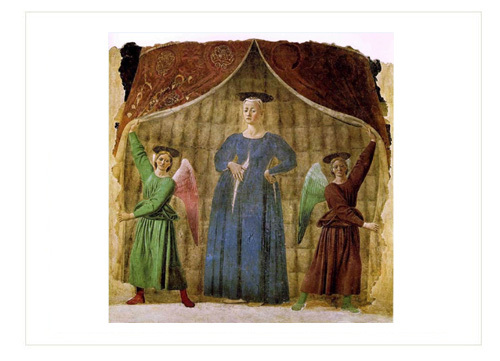 Apart from the spatial qualities of Piero’s works, Peter loved his use of complimentary colours – for instance, the socks and wings of the Madonna del Parto (Fig. 5). I am not sure that he took anything directly or consciously from Piero’s work, but I am sure that he was profoundly inspired by him. Was he drawn to this tradition? How far did he consciously apply this rationale to his own working process? IH: Definitely, he certainly applied it. The harmony and balance of the Golden Section appealed to him very much. He was not only drawn to the Renaissance, but also to the Hellenic sense of beauty and proportion… very unfashionable in the late ’70s when the art establishment became more politically engaged with events in Northern Ireland and Vietnam. 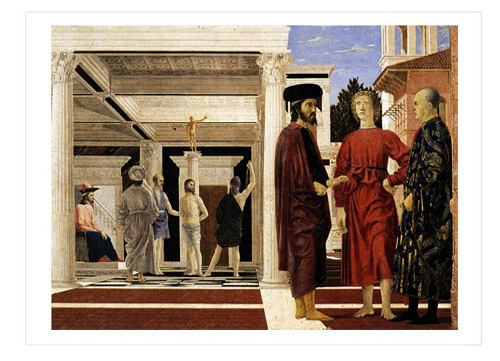 Peter had no inhibitions about applying the Golden Section to his work, he considered it a universal principle. CC: So although perhaps a classical idea like the Golden Section was perceived by some as an old-fashioned concept in the ’60s, it’s interesting that its residual effect in terms of balancing forms and colour is perceptible in aspects of art produced now. I recently saw new oils and watercolours by Callum Innes at the Whitworth Gallery, Manchester – his work is very different in tone, but the way he considers and places forms on to paper or canvas made me think of Peter’s compositions. 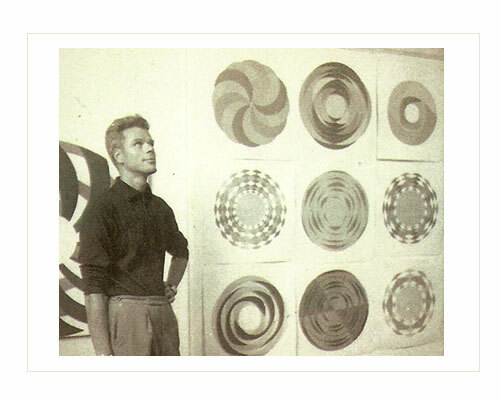 Working in the ’60s and into the ’70s, Peter was painting at the same time as artists such as Bridget Riley and Michael Kidner, whose work contributed to the wave of Op Art flourishing in Britain at the time. Yet, you once commented that Peter didn’t feel that his work in any way related to Op Art… can you say something more about this? He even did a few paintings. But soon he repudiated any praise for these works – ‘It’s too Op, it’s not what I want to do…’. Although it was very fashionable, Peter had a different vision for his work and developed a strong individual voice in his hard-edged images, incorporating the proportions of the Golden Section with a feeling for colour. The large areas of bright colour and his dislike of dazzling optical effects may have to do with his interest in the Russian Constructivists, the Bauhaus and his Scandinavian heritage. CC: Art movements which valued the power and beauty of form over the subject … I wonder if Peter would have relished making his art in early 1900s Paris or Moscow! From what you say, I get the impression that Peter was resolutely, even defiantly, swimming against the tide of what was fashionable in ’60s London… Was this typical of his character in other ways, perhaps in other cultural aspects? IH: It was typical of him in every way. He was very playful and had his own way of doing things, not only with regard to his professional creative activity but also when it came to cooking, gardening or anything else. He would diligently learn all the basics, then apply them without any regard to convention. He swam against the tide because it came naturally to him. Peter studied French and Spanish at Oxford and read very widely – from French, Spanish and English literature in the original, to Russian and German in translation. He listened to music constantly while working in the studio, only interrupted occasionally by the broadcast of a test match. His taste and knowledge of music was extensive, but particular favourites were Peter Grimes, The Rite of Spring, Verklaerte Nacht (Transfigured Night, Stockhausen), Elgar’s Cello Concerto, and others – Copland, Sibelius, Nielsen, Rachmaninov, Prokofiev, Bartok. He loved French music… in the weeks before Christmas we would sometimes hear L’Enfance du Christ through the open studio door. Whether or not music influenced his work directly I can’t say; that it was essential to his life, I am sure of. His whole life, his work, his eventual interest in gardening after he gave up painting by 1978, prove that he felt an aesthetic dimension was indispensable to our lives. Peter looked at the natural world as an artist. He would draw my attention to the structure of a leafless tree against a luminous sky or a vineyard in Provence in early spring with the leafless vines standing out against the red soil, or the shape of moving clouds seen through the window of a train. CC: There is something gently deceptive about Peter’s gouaches. Despite the precision of line and clearly placed forms on to paper, their overriding appeal comes from the tension they create between a calm sense of order and warm exuberant colour. This relationship results in an irresistible visual experience where colour really sings out. What is appealing about his abstract works is that they offer an equivalence with fundamental visual stimuli – colour, shape and texture. Perhaps, in the end, sensations like these are best left uninterpreted by art critics and writers! I hope Peter’s gouaches at the Rocket Gallery delight an even wider audience.